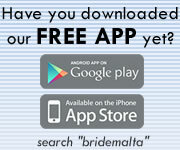 Bridemalta develops and maintains a wedding related portal. The website is completely free and visitors have the option of self registering for our newsletter. All our contact details can be found in the Contact Us section on the same website. You can contact us by post or by email at info@bridemalta.com or by telephone on +356 99446120. When you self register on our website or through our registration forms, we ask you for your name, contact telephone number, email address and details about your wedding namely wedding date. You can delete cookies using your browsers own Clear History function. You can reset your browser to refuse all cookies or to indicate when a cookie is being sent. However, some website and app features or services may not function properly without cookies. Most web browsers allow some control of cookies through the browser settings. It is important to note however that if you block cookies from Our site or apps there are a number of functions that may not work, and you will need to reset your preferences each time you log in. When you visit our website, within the webserver access logs we collect your IP address, page visited, date and time. We collect this information without making a direct reference to the visitor unless this is in included within the url of page requested. We will use your information to provide you with access to our newsletters which may contain special offers or competition notices. Whilst the emails or smses are sent by us, this could be done on behalf of our customers who have requested that we send the information to you, our registered members You understand that this information that you will receive is one of the main reasons why you have subscribed to our services and we send you this information to provide you with a service. Your personal information is stored in our online processing system which is based within the European Union. We do not share your information within any entity that is based outside of the European Union. As a policy we will not disclose any personal information to anyone other than those employees that need access to your data to provide you with a service. At times we may be required by law or legal process to disclose your personal information. Our website may, from time to time, contain links to other sites. We do not share your personal information with those websites and are not responsible for their privacy practices. We encourage you to learn about the privacy policies of any such company. If we are going to use your personal information differently from that stated at the time of collection, we will inform you. Furthermore you agree that you are the owner or you have the authorisation to provide us with any information required for us to provide you with a service. You bear all responsibility for the information you provide us and Bridemalta cannot be held responsible for any information you send us which does not have the necessary authorisations from the rightful owner of the information. If we determine that you have provided us with information which you do not own or do not have any authority to use, we will have no other option but to report such cases to the commissioner for data protection. In doing so, we reserve the right to terminate the relationship and denying any request for a refund or compensation (if applicable). We retain your information for as long as you remain subscribed to our services. We will only delete your details once we receive an un-subscription request from you, either electronically by email or by phone. We encourage you to contact us at any time and remind you of your right to opt out from receiving any promotional or marketing materials from us or any of our partners at any time. Please be aware that we validate all requests made to unsubscribe to any or all of our mailing lists. In this respect, whenever a request is received at our end, we will send an email to the same address from where the request originated to confirm the authenticity of the request and to confirm whether full or specific un-subscription is required.